They say the first impression is the one that lasts, and so it is here with the latest album by German electronic master Peter Frohmader: the album opens with the twelve minute "Spiral,” a majestic brew of sparkling sounds, rhythms and countercurrents, rippling through a rich melodic landscape of ever-changing textures. Sequences are played at different speeds, altered, recombined, torn apart, all the while riding on an intense rhythmic wave. Beyond this first track, the album moves on through various phases of electronic experimentation utilizing sequencers, samples, and taped bits; sometimes it works with splendid results — the brilliant "Spritedness" is a collection of unusual rhythmic patterns overlaid with everchanging sequences and bursts of voice samples; "Reflection" is a quieter piece which has an intermittent out-of-sync character, with notes in the main theme occurring a split second before or later than their accompaniment, all contributing to a disjointed feel which works well on this and a couple other tracks. "Persistence" offers a cyclical feel punctuated by what appear to be treated acoustic guitar samples, drums and percussion. A heavy bottom end drives "Emphasis,” while bell and flute samples mix with other synthetics. This is a long album, though — over 75 minutes, and not all the material works so well — occasionally getting lost in technique and experimentation and delivering little that the listener can resolve. Two eleven minute tracks "Hypnosis" and (especially) "Inexorability" are guilty of this — being very tedious overall — yet even these have some fine moments. In short, this is a good disc, the best material here could've been edited down to around 45 minutes and the album would've been all the better for it. And that's how long this album seems to last. Actually, I really like most of Frohmader's earlier works like Jules Verne Cycle or Homunculus Volume 2 (to name only a couple) which were highly innovative dark and unusual electronic, rock or zeuhl fusions. Many of these I would recommend unreservedly. My exploration of his music more or less came to a halt with Cuneiform's other Frohmader release Macrocosm which I must admit bored me to death. I'm not that familiar with his music in the interim between then and now, but I can still tell you that his flirtations and explorations with digital technology were much less to my liking than his analog/modular atmospheres on his earlier tracks. Cycle of Eternity is a far better album than Macrocosm yet it’s mostly just a bunch of digital sequencers in unusual patterns and combinations where basically some work well and others fall short. It does have Frohmader's distinctive touch — sort of in the same way masters like Klaus Schulze and Richard Pinhas have that make their music fairly identifiable, yet the mechanical and too clean sounds of the synths that are used give his normally dark feel and atmosphere too contradictory a feel. It does remind me in some ways of some of the sequencer work of Pinhas on his old Moog modular, yet is much more sterile and inhuman and in all truth rather dull. I'm still waiting for the Sensorium reissue of Cultes des Goules. 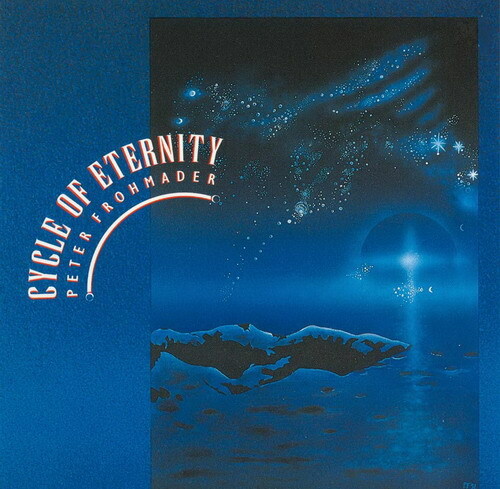 Cycle of Eternity is the latest release from Cuneiform electronic music artist Peter Frohmader. In typical Cuneiform fashion, it defies easy description, blending diverse influences with a strong originality making it a challenge, but ultimately a rewarding one, to listen to. Using a variety of synthesizers, samplers, and sequencers, Frohmader creates a dense and dynamic electronic minimalism. Atonal melodies float above convoluted sequenced patterns, and eerie drones and odd electronic and sampled noises create a mysterious and sometimes unsettling atmosphere. A few of the pieces use electronic percussion; others rely on the rhythmic strength of interweaving melodic and harmonic ostinatos. The nine pieces on this 75 minute CD are very well composed and executed, and have a strong sense of direction which is often absent from electronic music. The overall style is at times reminiscent of the minimalism of Louis Andriessen, at others, of Zappa's synclavier work and more recent ""serious" compositions. But mostly this is Frohmader's own brand of dark and powerfully moving electronics, some of the most engaging I have ever heard. A unique sound and brilliant execution make this a must-hear electronic music release.